As soon as I saw them, I knew these were coming home with me. What a dash of colour amidst all the winter white. Can you imagine the delight of my heart as I popped them into a vase and set them in front of me? And, then can you imagine the completely unplanned moment when having stopped at the library to pick up a book I had on hold, to find that it was Deborah Moggach's Tulip Fever? Of all the books I have in my 'reserve it' file, they had that one waiting for me. Too splendid for words! Now that's what I call a little glimpse of heaven tucked in an unexpected place! Here's wishing you your own sprightly bunches of heaven! Yes...I love the way you've described it! Oh I do love that color as well. I don't think I can trust bringing tulips home today (they'd freeze). Primroses won't be safe from me if I can find any. I saw tulips at the store last night beckoning to me but I ignored them...lol! A book too-WOW! What perfect timing! Sure do love splashes of color amidst all the wintery white. I do get tiny splashes of color as I browse my seed catalogues. I bought tulips this week as well...pretty pink ones. I find they bring so much colour and the promise of spring into my house. 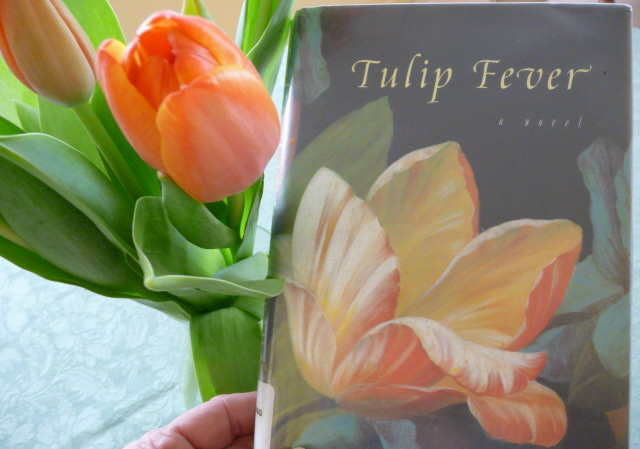 Your tulips are a beautiful colour and how wonderful to pick up a library book so you can enjoy them even more. I get excited when I see tulips in stores! I loved reading your post. I had the exact same experience at the store last night. I was ready to check out and glanced over and saw a bunch of Sunflowers! Fresh, and egg yellow - on this icy day, they are a reminder of the warm weather that will come! The tulips are gorgeous. I love the color. P.S. Planned by our Father, I meant!!! Truly planned... I always ask Him how he that does... he never tells me, but I think he was smile. You are my ray of sunshine today.....thank you so much for all your lovely comments. Brenda, What a sweet coincidence from God. Tulips have to be one of the best hopeful signs of warm sunshine and flowers to come. Lovely, Brenda, and thank you for dropping by for a quick visit with me and my buddy. Brenda, I agree with you, it is a touch of heaven for me on this Wednesday morning. The tulips are exceptionally beautiful, and certainly do make me look forward to the Spring. Hope you enjoy your book and a good cup of coffee with it. 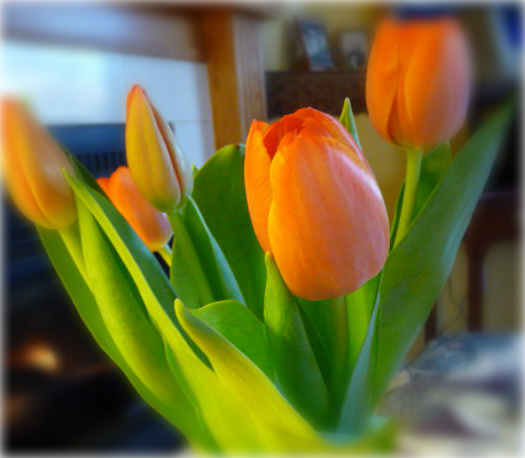 I've been enjoying some pink tulips at my house this week! I'm so happy to "meet" you here, my newest blog follower!! !